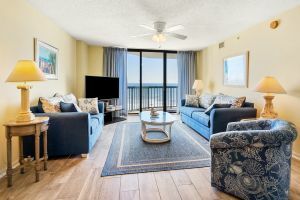 Pep up your vacation by reserving Ocean Bay Club 709 in the Ocean Drive section of North Myrtle Beach, South Carolina. 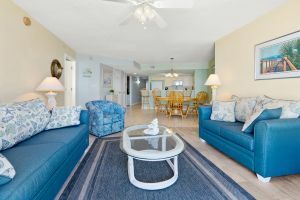 This beautiful and spacious oceanfront condominium in North Myrtle Beach, South Carolina has everything you need for a memorable and convenient vacation and it is superbly located near amusement rides and water slides. This North Myrtle Beach vacation rental has four bedrooms. 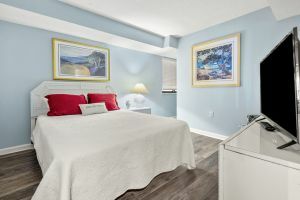 Eight people will sleep comfortably in this North Myrtle Beach vacation rental with two people in each bedroom. Nobody has to sleep in the living room during this vacation. However, the living room is most comfortable for conversation and watching television. This oceanfront condominium rental also boasts a fully furnished kitchen. 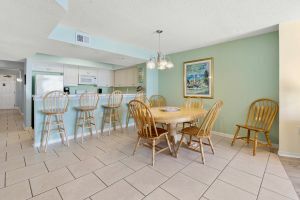 All the cookware you need is provided for you in the kitchen of this North Myrtle Beach vacation rental. 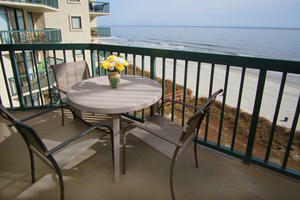 Make breakfast and snacks and enjoy them on the oceanfront balcony of this condo in North Myrtle Beach, South Carolina. When you vacation at Ocean Bay Club 709, you will even have a dishwasher in your oceanfront condo rental. Amenities at this North Myrtle Beach condo include wireless Internet access, washer/dryer unit and numerous televisions and DVD players. This North Myrtle Beach resort features an oceanfront pool deck with easy beach access so you can lounge in the lazy river, float in the pool, relax in the hot tub and read your books poolside before hitting the surf zone of the Atlantic Ocean. 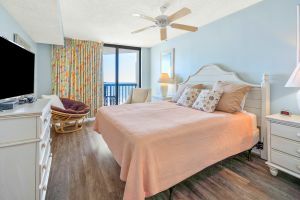 In close proximity to this North Myrtle Beach resort is the Cherry Grove Fishing Pier, beach clubs with shag dancing, live entertainment theatres, shopping, dining and water sports. 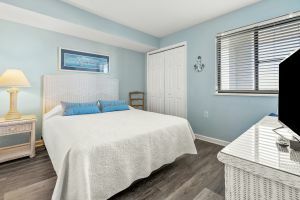 Within walking distance of this North Myrtle Beach vacation rental is Main Street where you will find cafes, shops and beach clubs. Championship golf courses are also right around the corner from Ocean Bay Club.